The Best Admissions Teams Know: “It’s Not (about) YOU, it’s (about) ME! 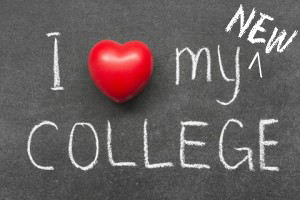 Light bulb moment: College admissions and dating have a great deal in common! “It’s not you, it’s me” is more than a classic break-up line, it is also a lesson for us in enrollment management. Developing a relationship with a prospective student (or a boyfriend/girlfriend) is much more about THEM than it is about YOU. Many times when we are on college campuses presenting our Interactive Counselor Training Workshops, we uncover a disconnect in the minds of admissions counselors on this very issue. Too often, the counselor spends too much time selling the institution rather than trying to understand what the student sees and feels as being valuable. Instead we encourage counselors to spend the time they have with a student to truly get to know the individual; his or her unique combination of interests, preferences, desires, anxieties, and aspirations. With that greater understanding you will naturally communicate a unique value proposition. The student will perceive you as unique among their available choices. You will have reached the coveted state of differentiation. In The Excitement Factor!, our recently released nationally co-sponsored study, 12,000 college-bound students told us that the college’s personal interest in them, or lack of it, was influential in their college selection decision. For a significant percentage of students who reached the application or admit stages of the funnel (36% to 42% of students in the public and private pools respectively) the issue of personal attention was a key factor in their ultimate choice. The answer to increasing enrollment in the face of the many challenges in higher education today tuition lies in taking an entirely student-centric approach to recruiting where the admission office and counselors realize that “it’s not about the institution – it’s about the student.” This is powerful when put into practice. Through our Interactive Counselor Training Workshops for counselors, we spend a great deal of time changing the focus of admission counselors. We see their transformation and improvements in productivity. Most importantly, we see changes in the recruiting process that exposes students to the information and experiences that truly interest and excite them. Continue the conversation on Twitter @LongmireCo. Be sure to Subscribe to Versions of Conversion today so you don’t miss any of this highly-valuable information. Karen Full is a highly-respected higher education professional who has held positions in admissions and enrollment management at several institutions in the Midwest and Florida. With her vast experience working with large and small, public and private colleges, Karen brings a valuable perspective to her role as an Enrollment Strategist at Longmire and Company. Call Karen at 913/492.1265 x.711 or email her at kfull@longmire-co.com. Follow Karen on Twitter @KarenAFull. This study is a partnership of private and public colleges and universities from across the country seeking powerful data about building the types of relationships with prospective students that will lead to enrollment. This is the seventh co-sponsored study we have facilitated in the past six years in an effort to help enrollment management professionals dive deeply into the heart of the issues impacting our industry. CLICK HERE to learn more about getting involved in this new study. A student’s first choice school is very likely to change. Roughly 40% of students from the pools of public and private colleges swap out their former first choice school with another institution during their college selection process. This happens in about 25% of cases for prospective community college students. Prospective students and their parents rank college pre-enrollment service lower than the post office, Walmart and their cell phone providers. Nationally, students and parents gave colleges and universities a rating of 6.83 in overall service during the college selection process. Compare that to the American Customer Satisfaction Index that reports the United States Postal Service receives an average rating of 7.4, banks earn a rating of 7.6, hospitals 7.7, wireless telephone providers 7.1, and discount stores 7.6. Need I say more? 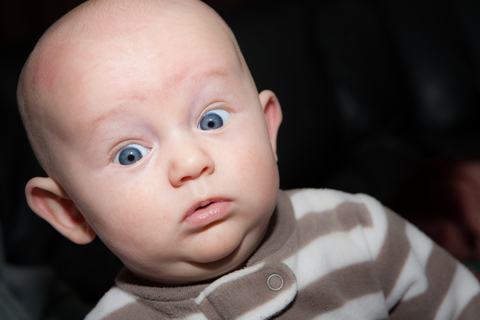 That prospective student you are working so hard to recruit? He or she thinks you don’t really care. “The Excitement Factor!” revealed that a student’s college selection is tied closely to the strength of the relationship they build with a college over time. Contributing to the overall relationship are interactions a prospective student has with current students, professors, admission counselors, and even people in points across campus and beyond that are unknown to the admission office. Additionally, students revealed that they can, and do, form strong connections with colleges that lead to enrollment without ever stepping foot on campus. 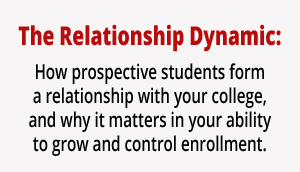 Building relationships is a complex, nuanced and powerful part of student recruitment. Colleges are asking what they can do to influence relationship-building with their prospective students in all aspects of their recruitment efforts, from social media to personal contact. And, they want to know how to involve all influencers, on or off campus, in the development of rich relationships with prospective students. Co-sponsors find our studies valuable because of the wealth of information they gain – information they can use to drive action and change. And because these studies attract a high number of co-sponsoring institutions they are extremely affordable, costing a fraction of the expense of an individual research project. For more information, download detailed information about the study by CLICKING HERE or call us at 913/492.1265 x.701. Rick Montgomery is as an Enrollment Strategist at Longmire and Company. With over 20 years in higher education marketing, he brings an innovative approach to helping colleges and universities meet their enrollment goals. Rick can be reached at 913/492.1265 x.708 or via email at rmontgomery@longmire-co.com. 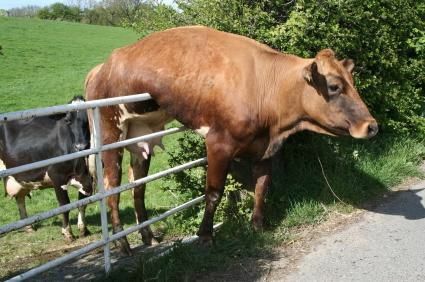 Our answer: When someone is stuck they need more than a nudge, they need to be lifted over that fence. The bottom line is that when you are working with a non-committed student in the late stage of the cycle, you can be certain that there’s a concern or objection that hasn’t been addressed. And, no matter where you are in the recruiting cycle, it is a GOOD thing when a prospective student or parent communicates a concern or objection about your college. Really. When a concern or objection is revealed, you can deal with it. If they don’t share their concerns, they’ll never enroll and you’ll never know why. There are several great ways to cope with objections and concerns. But the first thing you have to do is to determine whether they exist. The easiest way to do this is simply to ask. Ask the student whether they have any concerns or questions that would prevent them from attending your school. If they acknowledge that concerns exist, you have to isolate each one and respond to it. Questions, concerns, objections and indifference almost always arise during the college shopping process. And they vary widely. We train admission counselors in a variety of effective methods to manage each type. One of our favorite techniques is called the “Feel, Felt, Found” method of responding to a student’s concern. Let’s take the student who is “fence sitting” about enrolling for classes that begin in just two months. Your previous conversations have gone well and you have been told that your college is a likely choice but the student has failed to take the final step. It’s time to probe for the core concern and you should be direct. “Feel, Felt, Found” helps to dissolve a concern or objection by confirming that others had similar concerns that turned out to be unfounded. Often, it’s all you need to lift a student over the fence and onto the exciting next chapter of his or her life. We teach new and experienced counselors how to work smarter, recruit more effectively and, most importantly, adopt a student-centric approach to everything they do. Longmire and Company’s on-campus Interactive Training Workshops dramatically improve the performance of counselors and staff in areas such as effective communication with students and parents, applying creative entrepreneurship to their jobs, validating past and planned actions against outcomes, and discovering and leveraging the motivations of students (and themselves). The net result? Improved service to prospective students and families, measurable increases in yield, increased counselor and staff job satisfaction, enhanced teamwork, and innovations in work process within the department. From my many years in enrollment management, I know that summer is the ideal time to train and motivate your staff. Email or call me if you are interested in how we can help you have a powerhouse admissions team. Karen Full is a highly-respected higher education professional who has held positions in admissions and enrollment management at several institutions in the Midwest and Florida. With her vast experience working with large and small, public and private colleges, Karen brings a valuable perspective to her role as an Enrollment Strategist at Longmire and Company.Call Karen at 913/492.1265 x.711 or email her at kfull@longmire-co.com. Follow Karen on Twitter @KarenAFull. We have begun the college co-sponser sign-up process and in this short period of time it looks like this may be our largest nationally co-sponsored study yet (topping the 40 colleges that participated in last year’s study, “The Excitement Factor!”). Now, you can join a number of highly-respected colleges and universities including Hofstra, Purdue, University of Denver, Eastern Michigan University, University of Findlay, Eastern Kentucky, and Westminster College (PA) that have already jumped on board to get powerful data about building the types of relationships with prospective students that will lead to enrollment. We anticipate north of 45 to 50 public, private, and community colleges participating. And we always get a good mix of schools in terms of geography and size which allows for peer comparisons. Co-sponsors find our studies valuable because of the wealth of information they gain – information they can use to drive action and change. And becuase these studies attract a high number of co-sponsoring institutions they are extremely affordable, costing a fraction of the expense of an individual research project.